Talk to us on 1300-656-694. Easyshade Marquees have been supplying plain colour and printed school marquees since 2007. We supply tents to schools in all states and will gladly advise you. We offer a range of commercial grade aluminum frames in 3 separate sizes and frame weights. You can select the best frame weight for your exact needs. A primary school will definitely not require the same frame weight that will be used by pit teams or triathlon clubs. Talk to us for free advice. We will custom brand a marquee to your exact specifications. We offer print onto the entire roof or you can select areas which you wish to be printed. Please email your enquiry, we will get back to you quickly. We offer immediate delivery on plain colour marquees. We roofs and walls available in colours blue, green, red, yellow,white and black in sizes 3m x 3m, 4.5m x 3m and 6m x 3m. Our roofs are UV coated for sun protection and waterproof with sealed seams. We will provide free artwork layouts. Nothing will be printed until you approve. 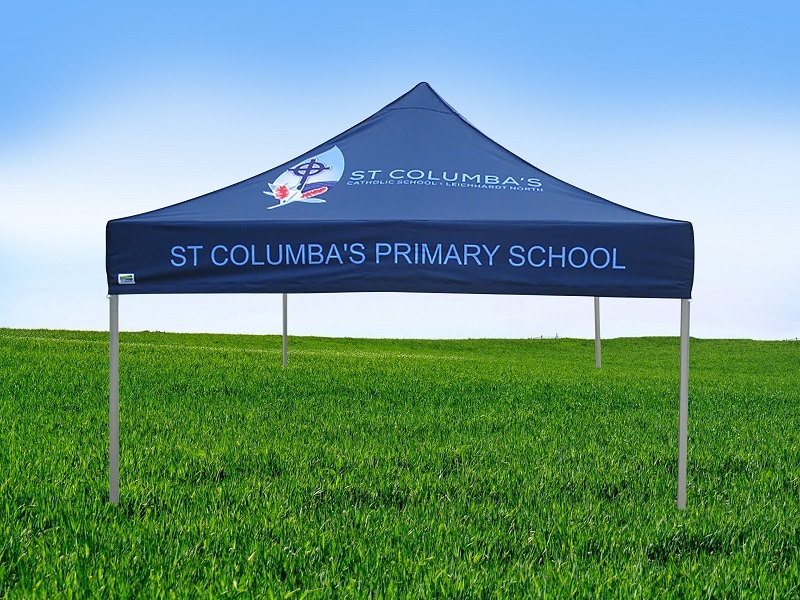 Our gazebo tents will provide shade for sun protection and shelter from the rain for your sports events and field days.We deliver marquees to schools in all states. Printed marquees for sports teams, rowing teams and houses with your custom printing. Plain colour school marquees please see sizes and specifications. We carry stock of popular school colours.